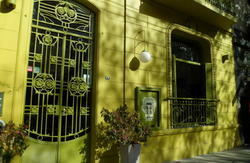 ARG Hostel was created for young people who are looking for an attractive place to stay in downtown Buenos Aires. Its strategic location means that we are just a few blocks from 'Congreso de la NaciÃ³n' (Parliament). This allows tourists to visit the main cultural attractions of the city by foot as well as the night-life centres. ARG Hostel is a five-floor building with a lift. It has private rooms for 1, 2, 3 or 4 people with or without private bathroom. Our kitchen is totally equipped. In the living room we have a TV, a bar and games. We offer free internet, a comfortable and friendly place and a homely and warm atmosphere. ARG Hostel is located two blocks from Rivadavia and Corrientes Avenues.